After officially exhausting all internal processes - former eNCA arts & entertainment journalist Nontobeko Sibisi prepares to fight abrupt and unfair dismissal at CCMA - Tuesday 02 August. After years of gracing our screens, delivering arts and entertainment journalism that is credible, creative and full of passion - it was a shock to hear of Nontobeko Sibisi’s abrupt and unfair dismissal as eNCA’s arts and entertainment reporter and now subsequent decline of appeal. Nothing can be detracted from the quality and professionalism of Sibisi's work. She has her own distinct and versatile style of storytelling, thats earned her an Arts Journalism Award in just a year in the field. What judges saw is very evident in her versatile body of journalism, from the passing of personalities such as Mandoza, Sifiso Ncwane, Lundi Tyamara, Thandi Klaasen. Not forgetting her memorable interviews with the likes of the braHugh Masekela, Thandiswa Mazwai, DJ Black Coffee, Zodwa Wabantu, The Manhattans, Angie Stone, Seal, Kevin Hart, Regina Belle, En Vogue to list but a few. Sibisi’s energy on screen and her genuine interest in artists and the arts is visible in her creative delivery. It then comes as a surprise that such talent that has produced commendable work, impressed editors, managers and audiences alike - exactly a year after #RespekTheDoek took the country by storm - she has now come to pay for standing up against eNCA’s embarrassing practices. 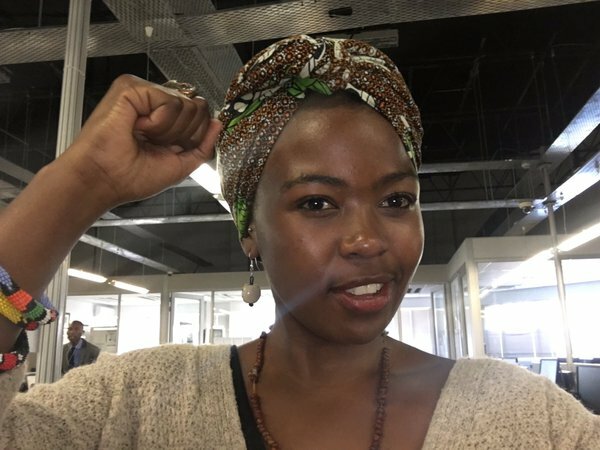 It is very clear that after Sibisi bravely challenged the company’s embarrassing and shameful “no-doek-on-air” practice last year, she has been singled out, victimized and made example off as a form of retaliation for the #RespekTheDoek campaign. A powerful movement that saw thousands of people in the country and outside wear their doeks in support of her. Already, last year action was to be taken against Sibisi but the overwhelming public outcry, support and image of eNCA saw the company halt all intended action. She has clearly been on thin-ice since then. Sibisi has always spoken out, challenged her managers and held them accountable for unfair, prejudice and racist practices within the organization. It is now evident that eNCA clearly viewed Sibisi as a “problem" that needed to be removed. eNCA laid four trumped up charges against Sibisi, charges that can be simplified in to two. These stem from a free trip approved by her line manager to cover the Cape Town Jazz Festival earlier this year. Substantively and procedurally Sibisi and her legal representation maintain that that the findings of her hearing where invalid and unfair. Sibisi’s line-managers knew, via email and in discussions, of Sibisi's initial Jazz Trip invitation, indemnity forms, itinerary and intended content coverage, a whole month prior to leaving for Cape Town. To Sibisi’s surprise, four days before the trip she was for the first time formally notified about concerns surrounding her trip. These included approval being given to Sibisi and her crew, authority on signing the trip's indemnity forms, and disclosing estimated content outcomes of “Inserts and lives” allegedly without discussing it with editors. The dates of the Jazz Trip also retrospectively became an issue following the passing of Joe Mafela, the actor’s funeral date overlapped with the company’s earlier commitment for Sibisi to report on the Jazz trip and her skills, like previous funerals where required. Sibisi was dishonest and didn’t follow the company's inconsistently applied editorial policy. The question arose of whether or not she had confirmed artists interviews that would allow her to submit a broadcast plan, of which she did submit. Furthermore, prior to the trip, Sibisi's line manager was copied in on communique with Jazz organizers clearly showing the progress of her artist interview requests. Not a single objection or concern was raised throughout the planning process. Sibisi's actions were not inconsistent to any other approved free trip undertaken - her editors were well aware of her trips. The company also pointed out concerns relating to indemnity forms filled out by Sibisi, alleging she “promised" estimated content outcomes by signing indemnity forms stipulating that she will be producing “inserts and live presence depending on resources” - this is now being viewed as signing away editorial independence, even though this was also discussed with managers, not mentioning the three line mangers who all had access to the indemnity forms and trip details. Sibisi was accused of lying and misrepresenting company policy by saying to organizers the company has a rule of not sharing rooms with colleagues - the company denies this standard practice, saying its not explicitly written down as policy - as if to say sharing rooms with working professionals is regular practice, of which Sibisi herself has never been subjected to. It’s further alleged, Sibisi omitted disclosing that a video editor had already accredited himself for the trip - even though that video editor was given permission by his respective line manager, going so far as to amend his roster to make him available - why and how is that being overlooked? eNCA insists she broke editorial policy and the company NOW views the trip as a “gift” that she failed to make known to the trip organisers - even though her manager, like any other trip, consented to the trip in 2016 and 2017, AND her inserts and live interviews were still aired on the channel. Lastly - it’s concluded that all the above actions amongst other allegations brought the company into disrepute even though no complaints were produced and the company still enjoys a continuous working relationship with trip organizers even after the jazz trip. Sibisi has since sought legal representation from Haffegee, Roskam & Savage Attorneys - her lawyers are challenging her dismissal on both procedural and substantive grounds. The chairperson of the enquiry was biased, his behaviour showed that he had a predisposition to find the employee guilty. Furthermore, the Company relied upon hearsay evidence and failed to call the necessary witnesses to provide the requisite evidence. Notwithstanding this, the Company’s evidence was accepted. A summary dismissal was an inapproproate sanction, especially for an employee who has no history of any verbal or written warnings. Its very plain to see what is at work. Sibisi is clearly being victimized, thrown under the bus by her managers and inevitably subjected to a kangaroo court that was substantively and procedurally unfair - whose chairperson had a clear and blatant intention of removing Sibisi.